Spacious & Private - 3 blocks to shops & restaurants in East Hampton Village! Gorgeous 4 BR, 2 bath w/ pool, gas grill. 10-40% off stays of 7 days or more! This spacious Cape Cod vacation home design was recently selected by HGTV for inclusion on its 'Home Styles' architecture series. It features four large, exquisitely furnished bedrooms and two full baths, stunning eat-in kitchen, sunny family/living room with fireplace, separate dining room, central air-conditioning, wireless high-speed internet access, and a swimming pool surrounded by a spacious rear yard. This house's ideal location in East Hampton Village offers complete privacy with proximity to village beaches, boutiques, restaurants, and theaters. A beautiful sundeck, outdoor shower, and lovely, landscaped grounds complete this pristine setting. The Cape sleeps eight comfortably. Best suited for families. Groups of more than 4 unrelated individuals prohibited by the Town of East Hampton. This vacation property is owned and managed by Hamptons Vacations, a family-owned company, which specializes in offering beautifully appointed, fully-equipped 3, 4, and 5 bedroom vacation home rentals for short-term stays in East Hampton. We maintain a level of quality, cleanliness, and attention to detail that is unsurpassed. Our owner/management team personally oversees our staff. For the ultimate in quality control, we visit each property between rentals to ensure that it is immaculate, fresh and ready for the next vacationing family. We look forward to the opportunity of hosting you and your family at one of our vacation home rentals during your holiday in the Hamptons and will strive to ensure that you thoroughly enjoy your stay. All properties owned by Hamptons Vacations have been carefully chosen with regard to the needs of our clientele. All of our settings are tranquil, safe, and easily accessible to beaches, shopping, and a full range of vacation activities. We are intimately familiar with the layout, the location, and the amenities of each of our vacation homes and look forward to assisting our guests in choosing the vacation rental that best fits their needs. Our staff's primary goal is to provide an especially enjoyable holiday to all of our vacationing families, including assisting with information regarding the area's finest restaurants, golf courses, tennis courts, charter boats, spa appointments, and other nearby activities. We also offer the following additional amenities upon request: daily maid service and catering of gourmet luncheons or dinners to the houses, pools, or beaches. In short, every effort on our part will be made to assure you a relaxing and care-free vacation during your stay. The Cape is located within a lovely 2 mile walk or bike ride to world famous Main Beach. The Cape is located on a quiet cul de sac in the heart of charming East Hampton Village within a short walk to all of the shops, boutiques, art galleries, restaurants, cafes, and bars. All linens and bath towels are provided. Also provided are starter quantities of consumable items (i.e. paper towels, dishwashing detergent, toilet paper, etc). Energy Star Certified large capacity washer. Energy Star Certified large capacity dryer. Complimentary wireless, high-speed internet access. Laptop required. (3) Large screen TV in living room. Two additional TVs in bedrooms. Impeccably Maintained, Bright, Light Interior and Decor, Beautiful New Swimming Pool, Central Air-Conditioning, High-Speed Wireless Internet Access, Three Color Cable TVs, Quality Linens and Bath Towels, Sun Deck with Dining and Chaises. Central Air-Conditioning. Energy Star Certified large capacity washer, Energy Star Certified large capacity dryer. All linens and bath towels are provided. Also provided are starter quantities of consumable items (i.e. paper towels, dishwashing detergent, toilet paper, etc). Wood fireplace. 3 Large screen TV in living room. Two additional TVs in bedrooms. Catering available. Complimentary wireless, high-speed internet access. Laptop required. Free long distance within the United States. Handicapped Accessible : Two bedrooms and one full bath (with tub) are located on the first floor. Lovely property in ideal location to walk into East Hampton. 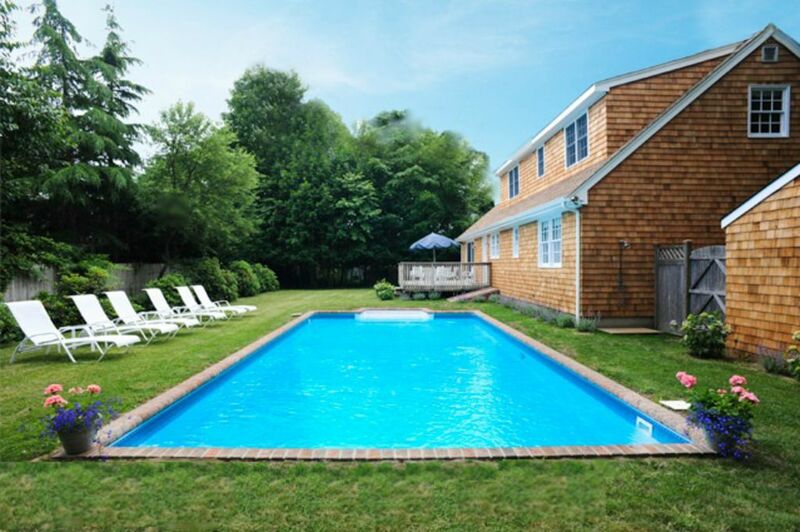 This is a lovely, well equipped property close to East Hampton. There is plenty of space for a group or family. Eric was a pleasure to deal with and replied promptly. Our only issue was that as the first guests of the season (memorial day weekend), it was obvious that the house had been locked up for a while and it was a bit dusty. Otherwise a fantastic stay and we would stay here again. The only thing that could make this better would be if the pool was heated! It was in the high 70s to 80s all week. I was fairly surprised that the pool though unheated was still usable. The house was impeccable and well furnished. Eric was a great host and was very responsive through the week. Highly recommended and thank you for a wonderful stay! Nice home. Short walk to downtown East Hampton. The home is a short (5 minute) walk to downtown East Hampton. Quiet street. Property manager was very responsive and accommodating. Home was clean and generally well-maintained. Pool was very clean - but not heated. It was too cold to swim in, in early June. Generally, the furnishings/decor is dated. A bit like staying at your grandparents house. This was our first experience with a house rental. It was a great house especially for a family with children. It was incredibly clean, easy to maintain, and stocked as described. The location was fantastic as we could walk to town and to the train station. Management was very responsive, friendly and helpful. Highly recommend. Our experience was excellent. from the friendly and helpful owner to the well decorated and fitted out house, we couldn't have asked for more. The beds were comfortable, the location at the end of the cul de sac was perfect, it was quiet and peaceful. A short lovely walk to town within 10 minutes and an opportunity to walk the local streets and take in the flora and fauna. Excellent stay and can't wait for my next trip. Will book again in a heart beat! Absolutely perfect location on a lovely EH street. Easily walk to town or just laze on your deck overlooking pool and backyard. House was spotlessly clean; quality linens and towels; completely supplied kitchen; beautifully decorated and comfortable. 2 bedrooms on ground floor and 2 upstairs make it convenient for all guests. There is nothing that is missing from this vacation rental except a view of the ocean! Manager/owner was always available with a smile and great conversation. We will be back! Walk to East Hampton Village cafes. Bike to ocean beaches. Walking Distance to East Hampton Village shopping boutiques, cafes, restaurants, theater, and tennis. Security deposit is returned within one week following departure. Rates are inclusive of all utilities (e.g. central air, high speed wireless internet, cable TV, unlimited phone service for domestic calls, etc) and inclusive of all other costs except for the final cleaning. Please do not hesitate to contact us with any questions at 631-324-1858.